The old Crown Prince Sultan is the father of Prince Bandar. Bandar is known to many in the world as “Bandar Bush” for his extremely close relationship with the Bush family. 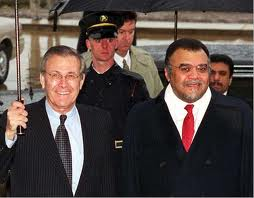 Bandar served as the Ambassador of Saudi Arabia to the U.S. from 1983 until 2005. The Royal family’s relationship with the Bush family goes back even further. Initially, in order to side-step Congress, the U.S. approached Prince Bandar to solicit Saudi aid in funding the Contras. Prince Bandar bin Sultan, who was the grandson of Ibn Saud, was appointed Saudi ambassador to the U.S. in 1983…. After Hezbollah bombed American facilities in Beirut and kidnapped CIA station chief William Buckley, it was Casey and Bandar who agreed to assassinate Sheikh Fadlallah, the terrorist group’s leader. Control of the operation was handed to the Saudis, who turned to the services of an operative from Britain’s elite special forces. The plan backfired, however, when the car bomb took down an apartment building near Beirut, killing eighty innocent civilians. Fadlallah escaped unharmed. And, to cover their tracks, the Saudis provided Fadlallah with information identifying the operatives they had hired..
Bob Woodward asserted that Cheney and Rumsfeld informed Prince Bandar of the decision to invade Iraq before Defense Sec. Colin Powell. Woodward told CBS 60 Minutes, “Saturday, Jan. 11 , with the president’s permission, Cheney and Rumsfeld call Bandar to Cheney’s West Wing office, and the chairman of the Joint Chiefs, Gen. Myers, is there with a top-secret map of the war plan. And it says, ‘Top secret. No foreign.’ No foreign means no foreigners are supposed to see this.” Defense Sec. Colin Powell was informed of the decision on Jan. 13th, 2003. It did not take long for questions to arise regarding his indirect involvment in 9/11. The possibility of a Saudi intelligence link emerged just hours after widespread reports of bank cheques indirectly linking two of the hijackers to a bank account under the name of a Saudi princess, the wife of the kingdom’s ambassador to Washington. The Saudi embassy angrily denied the suggestion, calling it “untrue and irresponsible”. A spokesman said there was no evidence that cheques from Princess Haifa bint Faisal’s Washington account went to the hijackers Nawaq al-Hazmi and Khalid al-Midhar. A FBI investigation leaked over the weekend traced regular monthly bank-certified cheques worth $3,500 (£2,200) from the princess’s account to a Saudi woman called Majida Dwaikat starting in early 2000, which was when Mrs Dwaikat’s husband, Osama Basnan, befriended al-Hazmi and al-Midhar in San Diego. ….Clarke offers an incendiary theory that, if true, would rewrite the history of the 9/11 attacks, suggesting that the CIA intentionally withheld information from the White House and FBI in 2000 and 2001 that two Saudi-born terrorists were on U.S. soil—terrorists who went on to become suicide hijackers on 9/11. “We would have conducted a massive sweep,” he said. “We would have conducted it publicly. We would have found those assholes. There’s no doubt in my mind, even with only a week left. They were using credit cards in their own names. They were staying in the Charles Hotel in Harvard Square, for heaven’s sake.” He said that “those guys would have been arrested within 24 hours. Grossi said Tampa police intelligence detectives called him about 11 a.m. Sept. 13, needing help with a special situation: They had been watching three young Saudi men – at least one a student at the University of Tampa – at their south Tampa apartment, and the trio was scared and wanted to go home. Jim Harf, director of [University of Tampa's] international programs, confirmed one of them is the son of Prince Sultan, the defense minister. Apparently arriving in the country “weeks before the attacks,” the son and two other Saudis were living an hour away from Sarasota in Tampa Bay, Florida. It is reported that they had come to the U.S. in order to learn English – and wanted to leave after 9/11 because they felt it was unsafe for them to stay. Close to 140 Saudis, a couple of dozen of which were bin Laden relatives, were reported to have been flown out of the country without heavy scrutiny or questioning by the FBI. This was during the unprecedented grounding of all flights nationwide following the attacks. Regarding the flights Colin Powell stated, “my understanding is that there was no sneaking out of the country; that the flights were well-known, and it was coordinated within the government.” The flights might have been discussed and arranged during the private meeting of Bandar, VP Cheney, Bush and Condoleezza Rice on September 13th. Richard Clarke has admitted to permitting the flights, though states he does not know the level of interrogation the flyers faced. The late Crown Prince Sultan bin Abdul Aziz held the third highest position of Interior Minister to the Kingdom of Saudi Arabia during the 9/11 attacks. Calling themselves Families United to Bankrupt Terrorism, the plaintiffs are suing seven international banks; eight Islamic foundations, charities and their subsidiaries; individual terrorist financiers; the Saudi bin Laden Group; three Saudi princes; and the government of Sudan for allegedly bankrolling the terrorist al Qaeda network, Osama bin Laden and the Taliban. Among the allegations in the complaint, said attorney Ron Motley, are that certain members of the Saudi royal family have been active supporters of and helped fund al Qaeda and bin Laden. The attorneys and investigators were able to obtain, through French intelligence, the translation of a secretly recorded meeting between representatives of bin Laden and three Saudi princes in which they sought to pay him hush money to keep him from attacking their enterprises in Saudi Arabia, Motley said. Baker’s business links to the Saudis date back to 1981, when Khalid bin Mahfouz helped develop a seventy-five-story office building for the Texas Commerce Bank, in which Baker owned more than $7 million in stock. James Baker is a senior counselor and partner at the Carlyle Group, which had many Saudi investors, including members of the bin Laden family. Saudi’s richest investors are threatening to pull billions of dollars out of America in anger at suggestions they helped fund Osama bin Laden. This threat comes as foreign investment in the US dries up because of business scandals, lower corporate earnings and the collapse of the technology boom. According to government figures, foreigners put $124 billion into the US last year, down from $301 billion in 2000. Economists say the reluctance of wealthy outsiders to expand their business interests in America is a major threat to the world’s largest economy. Saudi investors have $750 billion in the US. A mass walkout would seriously impede the US’s attempts to pull away from recession. During the trial, it was revealed that Prince Sultan had donated over a $2 million dollars to organizations such as WAMY and the IIRO. Both organizations were investigated and suspected of having funded Al Qaeda operations, directly or indirectly. …purchases the best weapons money can buy, including U.S. tanks, fighter planes, missiles and Awacs (airborne warning and control systems). Yet, in spite of billions spent, the Saudi military is considered inadequate, and much of the gear reportedly sits abandoned. Sultan, who has been dubbed Mr. 10 Percent, supposedly became extraordinarily wealthy from kickbacks from Western businesses that handled multibillion-dollar defense contracts. In a series of rulings, a number of defendants are removed from a 9/11 lawsuit filed in August 2002. One judge writes in a ruling, “Whatever their actions, they were performed in their official (government) capacities.” According to the court ruling, only the US president, not the courts, has the authority to label a foreign nation as a terrorist supporter. Judges rule that the plaintiffs failed to provide sufficient facts to overcome the kingdom of Saudi Arabia’s immunity. Saudi defense minister Prince Sultan bin Abdul Aziz, Saudi ambassador to Britain Prince Turki al-Faisal, and Prince Mohammed Al-Faisal Al-Saud, among others, are dismissed from the lawsuit, but the lawsuit is allowed to proceed against many more defendants, including the Saudi Binladin Group, the multibillion dollar bin Laden family company. Diplomatic Immunity was going to keep the Prince and others from answering too many questions. The executive branch of the US Government could have had a say in moving around the Diplomatic status, and it could have done so in the name of “public interest.” Seeing that the Bush’s good family friends law firm Baker Botts was defending the Prince in Court, it was not likely to happen that Bush would move the Immunity to prosecute the Prince – even if the public was interested. The court case was eventually dropped in 2005 though the families appealed, and in 2006 an appeals court decided in favor of the lower Court’s decision. In 2008 the case was brought to a Federal Judge who in the end ruled in support of the appeals court. Documents gathered by lawyers for the families of Sept. 11 victims provide new evidence of extensive financial support for Al Qaeda and other extremist groups by members of the Saudi royal family, but the material may never find its way into court because of legal and diplomatic obstacles. Adding to the intrigue, classified American intelligence documents related to Saudi finances were leaked anonymously to lawyers for the families. The Justice Department had the lawyers’ copies destroyed and now wants to prevent a judge from even looking at the material. In a 2011 lawsuit by Lloyds, an insurance agency from Europe, money was sought out for damages it had paid out to individual victims of the 9/11 attacks by again suing Saudi based organizations. Within 2 weeks the case was voluntarily dropped. The new lawsuit by Lloyds and the old one by the 9/11 family members had named Nayef (sometimes spelled Naif) al Abdul Aziz as a defendant. Nayef had been Director of the Saudi Joint Relief Committee which is alleged to have sent over $70 million to Al Qaeda, directly or indirectly. Its complaint, which quotes heavily from US diplomatic cables released by WikiLeaks detailing investigations by the US authorities into al-Qa’ida, attempts to establish funding links between some Saudi charities, and the terror group, and implicate the Saudi government in that funding through its support of the charities. The case singles out the activities of a charity, the Saudi Joint Relief Committee for Kosovo and Chechnya (SJRC), which was alleged by UN officials to have been used as a cover by several al-Qa’ida operatives, including two men who acted as directors of the charity. It is alleged that at the time the SJRC was under the control of Prince Naif bin Abdul Aziz al-Saud, half-brother of King Abdullah and the long-standing Saudi Interior minister. The claim states: “Between 1998 and 2000, the Kingdom of Saudi Arabia, through the SJRC, diverted more than $74m to al-Qa’ida members and loyalists affiliated with SJRC bureaus. Throughout this time, the Committee was under the supervision and control of Saudi Interior Minister Prince Naif bin Abdul Aziz. The details of the case may be uploaded online. Following a comment-thread on an article that investigative journalist Russ baker wrote, Russ mentions he has obtained the court filings of the case and will post them online as possible. The 9/11 families still seek answers. The Saudi Royals have so far escaped trial despite having so many connections to the alleged hijackers. Keep in mind the 28 pages of the joint Congressional report on the attacks of 9/11 blacked out by George W. Bush. Those pages were said to contain information regarding “specific sources of foreign support for some of the September 11 hijackers while they were in the United States.” It is widely assumed that the information that was redacted in those 28 pages concentrated on the Saudis. Senator and 9/11 Joint Inquiry Co-Chairman Bob Graham has called for a deeper 9/11 investigation based upon the Saudi connections. Bob Graham recently visited MSNBC host Dylan Ratigan to discuss this during the 10th anniversary. “In the final report of the congressional inquiry, there was a chapter related primarily to the Saudi role in 9/11 that was totally censored, every word of the chapter has been withheld from the public,” Graham says on MSNBC’s The Dylan Ratigan Show. Kissinger claims he did no current work for any oil companies or Mideast clients, but several corporations with heavy investments in Saudi Arabia, such as ABB Group, a Swiss-Swedish engineering firm, and Boeing Corp., pay him consulting fees of at least $250,000 a year. A Boeing spokesman said its “long-standing” relationship with Kissinger involved advice on deals in East Asia, not Saudi Arabia. Boeing sold $7.2 billion worth of aircraft to Saudi Arabia in 1995. 9/11 Commission Executive Director Philip Zelikow prevents two investigators, Mike Jacobson and Dana Leseman, from viewing a key document they need for their work. Jacobson and Leseman are working on the ‘Saudi Connection’ section of the commission’s investigation, researching leads that there may have been a link between two of the 9/11 hijackers, Khalid Almihdhar and Nawaf Alhazmi, and elements of the government of Saudi Arabia. Zelikow is also involved in another, related dispute with Leseman at this time. 9/11 Commission Executive Director Philip Zelikow fires one of the commission’s investigators, Dana Leseman, with whom he has had a number of conflicts. Leseman and a colleague were researching a possible link between two of the 9/11 hijackers, Khalid Almihdhar and Nawaf Alhazmi, and elements of the government of Saudi Arabia. Was Zelikow protecting CIA Brass, the Bush family, the Saudis…? Zelikow and the 9/11 Commission Report failed. This article is barely scratching the surface of the 9/11 Saudi connections to 9/11. For instance: The late Crown Prince Sultan had employed one Omar al-Bayoumi before Omar moved to the U.S. in 1994. Al-Bayoumi was receiving paychecks from a Saudi aviation company with extensive ties to the Suadi Ministry of Defense, while he was living in California. Which two alleged hijackers did al-Bayoumi meet at a restaurant after they flew into the LA airport in January, 2000, from Kuala Lumpur? None other than Khalid Almihdhar and Nawaf Alhazmi! Accroding to an FBI document obtained by Intelwire (PDF here), Khalid Almihdhar and Nawaf Alhazmi lived with Omar al-Bayoumi for a while as well. These are same two alleged hijackers that were possibly receiving money from the late Crown Prince’s son Bandar’s wife, the same two that Zelikow seemed to go to lengths to protect, the same two who Richard Clarke alledges CIA brass were hiding from him in order to recruit them for double-agent work, and that’s not all. Though the Crown Prince is deceased but his son Bandar and brother Nayef continue to reign. Other brothers and sons also flourish in the Kingdom. The Saudi Arabia web of dealings, especially with the Bush’s, are far from completely known and deserve more attention. The power-structure remains unchanged today. The Obama Administration has failed to follow through on its promises to the 9/11 family members who say they were “misled” by him, at best. Damn! How can I fix the text so it is not put to the far right? * I see, if you use Explorer to view the post it will be off center. Chrome works just fine, Firefox too. grumpy brian on Mon, 10/31/2011 - 4:00pm. I know... Explorer moves everything to the right. It used to not be this way with Explorer on viewing 911blogger. About 9 months ago or so, I noticed the problem kept getting worse. Some blog entries do not go to the right side of the page, while others do, especially after clicking for the full article. I use Firefox for 911blogger now. TomT on Tue, 11/01/2011 - 5:21pm. is a turd that's been circling the bowl for a decade. Microsoft needs to flush it. I recommend switching to Chrome/Chromium, Firefox, or Opera. zombie bill hicks on Thu, 11/03/2011 - 9:29am.